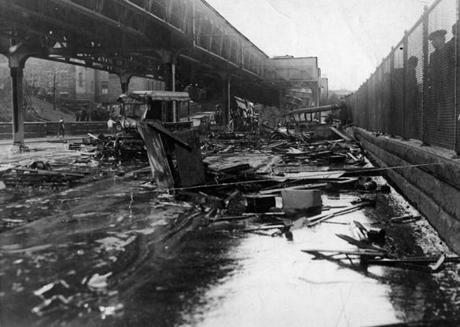 Officials and rescuers survey the aftermath of the flood of molasses the day after Purity Distilling Company’s tank collapsed in January 1919. 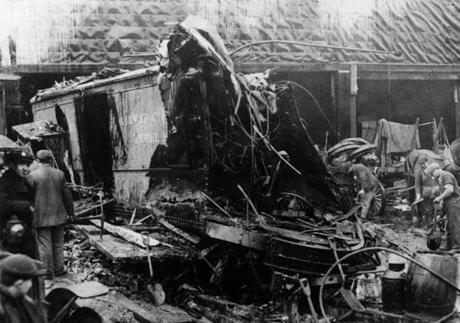 Twenty-one people were killed and dozens more were injured. One hundred years ago today an enormous steel tank ruptured, sending a torrent of brown syrup on a deadly path through the North End. Hollywood has made movies starring all manner of disasters, from rogue tornadoes and invading aliens to giant solar flares that fry the earth. But even the masters of make-believe haven’t conceived of anything as strange — or strangely devastating — as what happened that afternoon in January 1919. Any trace of the tragedy’s gummy residue has long since been scrubbed from the neighborhood’s narrow streets, but a small, easy-to-overlook plaque at Commercial Street and Copp’s Hill Terrace marks the spot where a towering steel tank containing 2.3 million gallons of molasses suddenly ruptured, releasing a torrent of syrup that strangled and destroyed everything in its path in a matter of minutes. The story of the bizarre and deadly deluge has been oft told over the years — Stephen Puleo’s meticulously researched 2003 book, Dark Tide: The Great Boston Molasses Flood of 1919, is the definitive account — but somehow the event is still unfamiliar even to many North End residents, nevermind all those rubberneckers shuffling down Hanover Street looking for the Paul Revere House or Regina Pizzeria. “The molasses flood got huge press coverage at the time, but then it faded from public memory,” says Liz Nelson Weaver, a member of Friends of the Boston Harborwalk, a volunteer group that’s won approval to install a more “engaging, interpretative” sign about the flood. And yet, we’re talking about molasses, the otherwise innocuous treacle used to give batters and gingerbread a brown cast and a quality chew. The gooey byproduct of refined sugarcane was much in demand during World War I because it could be converted to industrial alcohol, a critical ingredient in the manufacture of munitions. In 1915, the Purity Distilling Company had built a holding tank some 50-feet tall on Commercial Street, choosing the location for its proximity to Boston Harbor — molasses arrived from Puerto Rico and points south — and to the nearby railroad tracks that shuttled the sugary ooze to the manufacturing plant in Cambridge. But in its haste to construct the tank — in a precinct populated, not coincidentally, by poor Italian immigrants powerless to prevent such a thing from being shoehorned into their neighborhood — the company’s profit-hungry bosses dispensed with tests that would have revealed the structure’s lethal flaws. The result was predictable. Indeed, signs of trouble appeared almost immediately in the form of dark, pearly streaks of molasses that ran down the sides of the monstrous tank. Street urchins greedily scraped up the gunk, using sticks to make primitive lollipops. But instead of inspecting the tank, the owners merely painted it brown to disguise the leaks. Residents and passersby also reported hearing a peculiar groaning sound coming from the mammoth cauldron long before it erupted. Just after noon on January 15, 1919, with the sun high in the sky and temperatures topping 40 degrees, the tank failed spectacularly, coming apart like a wet paper bag and sending a wall of molasses roaring through the neighborhood. Moving at a rate of 50 feet per second, the rising tide leveled buildings and buckled the steel girders of the elevated railway, overwhelming everything and everyone in its wake, including 10-year-old Pasquale Iantosca, who was struck and killed by a train car swept from the tracks. It was a hideous scene, and when the temperature plunged overnight, the dead became entombed in the hardened sugar, forcing frantic workers to use saws and chisels to clear wreckage and retrieve bodies. The rescue effort was painstaking and protracted. Flaminio Gallerani’s body was discovered 11 days after the spill, while the body of Cesare Nicolo, a wagon driver, wouldn’t be found for another four months, pulled from the water under Commercial Wharf. More than 100 lawsuits were filed against the United States Industrial Alcohol Company, the owner of Purity Distilling, whose lawyers tried, perhaps cynically, to blame Italian anarchists for the disaster, claiming that radicals had bombed the tank. But the judge wasn’t buying it. The accident, he ruled, was the result of shoddy design and construction — the same type of brittle steel had been used on the Titanic, which sank seven years before the flood — and USIA was ordered to pay about $630,000 in settlements. Though small consolation to the families of the victims, the verdict prompted Boston, and many other US cities and towns, to tighten laws regulating development. “The molasses flood did for building construction standards what the Cocoanut Grove fire did for fire safety,” says Puleo. Over time, the molasses flood has become a subject of weird fascination for amateur sleuths and academics. In 2016, students taking an Introduction to Fluid Dynamics class at Harvard studied the effects of the weather that day, concluding that the 13,000 tons of tacky sweetener spread rapidly because it was warm from the tank, but then stiffened quickly in the cold air, impeding rescuers and costing lives. While it’s largely unknown to folks outside of Boston, the unnatural disaster surfaces from time to time in popular culture. Author Dennis Lehane’s 2008 novel, The Given Day, a Prohibition-era tale of bad cops, Brahmins, and feisty broads, includes a memorable scene of the molasses flood, and Comedy Central’s Drunk History produced an amusing — and more or less historically accurate — mockumentary about the tragedy. A 15-foot wave of molasses smashed vehicles and left debris all around the North End. An estimated 2.3 million gallons of molasses were released into the streets when the tank collapsed. Then there’s Francine Pellegrino, who spent the past two decades writing a musical about the sticky situation. A New York native who lives in Boston, Pellegrino says she fell in love with the North End long ago, enchanted by its cobblestone streets and the tantalizing aroma of olives and artichoke hearts that lingers in the air. She was working on a stage production about one of the neighborhood’s many immigrant families when someone mentioned the events of 1919. Called Molasses in January, Pellegrino’s musical had a two-month Off Broadway run last spring at The Theater Center. But on a tiny stage, and constrained by an even tinier budget, she couldn’t quite re-create the catastrophic flood. “We turned the lights off and had people screaming, and then turned the lights on and had people laying down on stage,” she says. Puleo, meanwhile, has been busy with speaking engagements timed to the spill’s centennial. In case you’re wondering, yes, Dark Tide has been optioned by a Hollywood producer, but Puleo’s not sure if his book will ever make it to the big screen. “To do this thing justice, the special effects would be really costly,” he says. And, really, would anyone believe it anyway? Part of the tank smashed into the walls of the freight house of the Bay State Street Railway Co. with enough force to tear the structure apart. Historian Stephen Puleo discusses his book “Dark Tide: The Great Boston Molasses Flood of 1919” on the centennial of the flood, January 15, at 6 p.m. at the Boston Public Library in Copley Square.